Jake Gyllenhaal back to his darker roots. Photo from the Huffington Post. 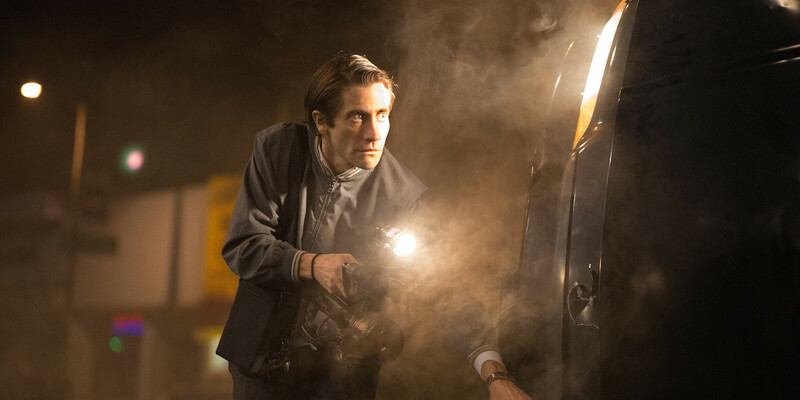 “Nightcrawler” gives us a lead you aren’t meant to cheer for in this smart crime thriller. Gyllenhaal portrays Lou Bloom, a complete sociopath with dreams of making it big in the city. Through a chance encounter, Lou finds out about the market for breaking news clips and decides to buy a camera for himself. Lou is introduced as a petty crook trying to move up in the world, but there’s something off about this guy. Lou is a loner and overall shifty guy; it’s in his voice, his walk and even his gaze, inspiring a feeling that something isn’t right with him. Gyllenhaal’s performance is what makes this film: The creepiness that oozes from Lou sells the sociopath vibe that director and writer Dan Gilroy want you to feel. Maybe the scariest thing about Lou is his ability to manipulate people. Rene Russo, seeing Lou as a way of saving her failing career, keeps going to Lou’s progressively more disturbing footage. Each time she is met with resistance by the station’s staff, who take the role of the angel sitting on Russo’s shoulder. Lou’s decline is slow at first, but drastically picks up speed once he sees how a lack of ethics can increase his status in the professional world. He always pushes the envelope, testing the boundaries of what he can do, and finds a home in reporting bloody news. While Gyllenhaal steals the show, the supporting cast of this movie help make the film the gem that it is. Rene Russo as the news director Lou sells his work to, and Riz Ahmed, who plays Lou’s employee, aid in showing how manipulative Lou can be. He starts off small with both of them, acting polite and presenting himself as a normal hardworking man, however over time he is able to get them to do things they are uncomfortable with. With Russo’s character, he uses her situation to get a reliable source to sell his product to. With Ahmed’s character, it is more of a charismatic hold that Lou has over him. This film truly is a criticism of modern media, cleverly disguised as a thriller. Lou doesn’t care about ethics, he just wants airtime. He doesn’t care about the morality of his actions, or if his stories serve any other purpose than to establish his reputation in the news business. Lou isn’t out to inform, he’s out to get attention. He has no concern for the truth and the only thing he values is a story he can sell. This film’s only blatant flaw is an issue of pacing. “Nightcrawler” can drag a little; sometimes Gilroy takes his sweet time building to the suspense. This is painfully displayed towards the end of the film. While I won’t give any specific details, it’s done through a sequence where Gyllenhaal stalks someone for a story. While the payoff is great, the build takes a long time to go anywhere. Gilroy’s “Nightcrawler” is a rare treat in the thriller genre, managing to be smart without losing its edge. Gyllenhaal steals the show as the films disturbed protagonist, and truly makes the film.